Sometimes it helps to look back, to get a different perspective on what is happening at the moment. 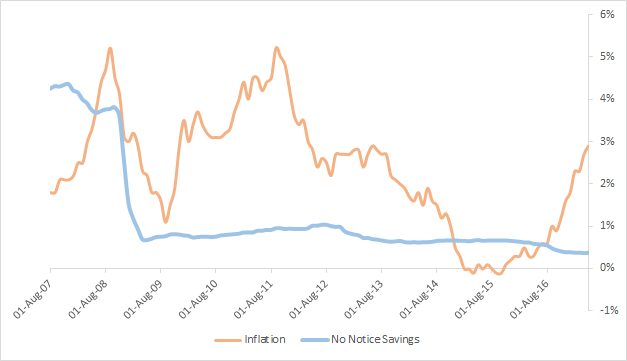 Doing so has revealed that over the last 10 years, the rate of inflation has outpaced no notice savings account rates over 75% of the time, mainly due to the latter having remained flat since April 2009. Moneyfacts data has found that since August 2007, the no notice savings account rate (as measured at the start of each month) has managed to sit above inflation only 29 out of the 118 months, which means that savers have been able to enjoy an inflation-beating rate on their emergency pots only 24.6% of the time. 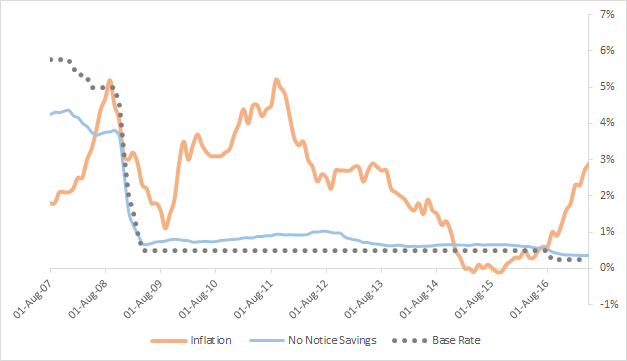 What's more, as you can see from the graph below, the no notice rate has remained largely flat over the last decade, with the varied movement in the inflation rate across the years having had no impact on the savings rate. We are all aware of the various reasons why the savings rate plummeted in April 2009, with it being the same time the bank base rate was reduced to 0.5% in response to the financial crisis. Indeed, if you add in the changes to base rate over the same time period (below), you can see it has a lot in common with the trend of the average no notice savings rate. This is why last week's news that base rate is unlikely to rise anytime soon (also discussed yesterday is so disappointing. However, what it also shows is that savers shouldn't be disheartened by reports of rising inflation. Instead, savers should do their best to fight the apathy that may be threatening to take away their savings appetite, and continue looking for the best rates – whether by searching through the no notice Best Buys, agreeing to give some notice to get a better rate, or investing in a high interest current account or two. The two graphs above illustrate that no matter what inflation does – and it is highly likely to continue going up for the foreseeable future – it's no excuse not to invest in a decent savings account and continue, or start, to grow your savings pot.